Ball Pint Mason Jars 12pk Just $1.18! You are here: Home / Great Deals / Ball Pint Mason Jars 12pk Just $1.18! Wow! These come in handy so many ways – I love to keep them on hand! You can get this 12pk of Ball pint Mason Jars for just $1.18 right now PLUS FREE in-store pickup! The Ball regular-mouth pint Mason jars are a canning classic that’s been trusted by generations of home canners for over 125 years. These regular-mouth jars are the style most home canners choose for jellies and preserves, purees and salsas, relishes and chopped or pourable foods. They’re the ideal jars for your flavorful spaghetti sauce, spicy corn relish, fragrant berry jam and fresh-tasting lemon curd. 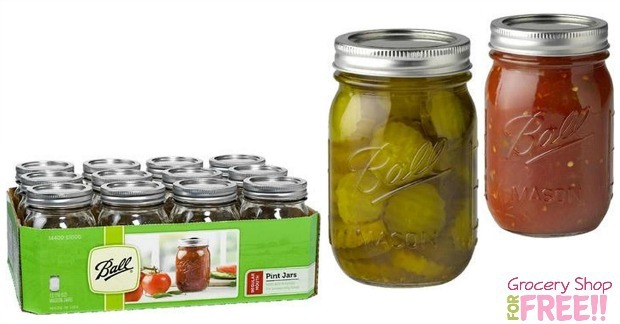 Lids and rings are included with this complete set of one dozen pint jars. Preserving food is easy with these regular-mouth pint Mason jars, and the taste is superior to anything found at the grocery store. You start with fresher ingredients, cook in smaller batches and completely control the process. Whether you prepare heritage vegetables or exotic gourmet preserves, these classic jars show off your creations beautifully. In the heart of winter you can open a jar and taste summer once again. Points up in your account 1 day after transaction and will expire in 14 days. Limit one reward per member.